What are the reasons for your belief or unbelief in God? On a recent cruise vacation, my wife and I visited the Island of Gozo, part of Malta, where we toured the Ggantija Temples dating back to 3600 BC. This makes them older than the pyramids of Egypt and Stonehenge in England. Eighteen hundred years before Abraham, these ancient ruins reveal the human heart attempting to acknowledge a cause, force, or person larger than itself to explain our existence. God created us with a desire to seek him. It is part of our DNA. Intuitively, we know that there is something more than ourselves to explain all that we observe in the world in which we live. God demonstrated his great love for us by becoming one of us in the person of Jesus, in order to bring his presence into the world in a very visible way at a specific time in history. Jesus demonstrated his great love for us by sacrificing his life to free us from the grip of sin and Satan’s power over the world. By the resurrection of Jesus, God confirmed the saving nature and power of that sacrifice. In contrast to the people of the ancient world, we are blessed to have the benefit of God’s revelation through the prophets, scripture, the words of Jesus and the teaching of the Church over many centuries. God’s plan for creation is to dwell in us, his human creatures, through his son, Jesus Christ, so that we, with the power of the Holy Spirit, can partner with God in bringing his presence to the people and circumstances of our lives. We are incomplete without God in our life. No matter the knowledge we have gained, the success we have achieved, the fame we have experienced, the wealth we have accumulated, the friends we have made, we are not complete and will not be satisfied until we ask the God of all creation to dwell in us. Forgive me, Lord, for my sins and excluding you from the core of my life. Come, dwell in my heart. This entry was posted in Belief vs. Unbelief in God, Uncategorized and tagged Reasons for Belief on June 30, 2016 by Bill Dalgetty. Do your actions attest to your faith? 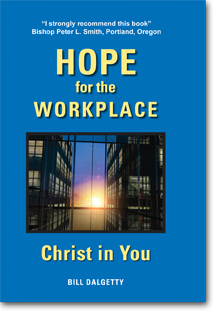 When I worked in the legal department of a large international oil company we had an administrative assistant who was quite vocal about her Christian faith. Her conversation was filled with references to her Christian beliefs and opinions on a variety of subjects. Her job performance in providing administrative assistance to three attorneys, however, fell short of the expectations for her position. It fell to me to counsel her about her performance. I will never forget her response when I pointed out that her work in serving the three attorneys assigned to her was not meeting the requirements for her job. Indignantly, she declared, “I don’t serve anyone but God! Bearing fruit in our lives is important to Jesus. He said, “I chose you and appointed you to go and bear fruit – fruit that will last.” (John 15:16) What kind of fruit? St. Paul sets out in Galatians 5:22-23 what he describes as the fruit of the spirit – “love, joy, peace, patience, kindness, goodness, faithfulness, gentleness and self-control.” I believe that faithfulness also includes seeking to do our best. In the Parable of the Talents, Jesus is very harsh with the servant who buried the talent he had been given instead of investing and multiplying it — a lack of action. In the Parable of the Sheep and Goats, Jesus condemns the people who did not provide food, drink, shelter, medical care and their time to individuals in need – a lack of action. This is not about whether salvation comes from faith or works. This is about whether our actions make our faith and love real. Scripture tells us that God is love. Being omnipotent, God can of course exhibit that love through consolation in prayer or in any number of ways. Oftentimes, his way is to use us in bringing that love to others. This entry was posted in Faith and Action and tagged Action making faith real on June 21, 2016 by Bill Dalgetty. Does God Dwell in You? In Galatians 2:20, St. Paul says, “I have been crucified with Christ and I no longer live, but Christ lives in me.” Do we as Christians really believe that Christ lives in us, and more importantly, do we live our lives as if God the Father, Son and Holy Spirit is present in us? Think of having the Lord’s ever-present counsel in how to respond to a difficult colleague at work, a child in need of discipline, a friend who needs someone to talk to, the morality of a certain business practice, the need to reconcile with someone you have offended, and all the myriad of life’s daily challenges. Three times, St Paul speaks of this in terms of our being “the temple of the living God” and “the temple of the Holy Spirit that is in you.” (2 Co. 6:16, 19; 1 Co. 3:16) In other words, we are the place where God dwells. God’s plan for his creation is to dwell in us through his son, Jesus Christ, so that we, with the power of the Holy Spirit, can partner with God in bringing his presence to the people and circumstances of our lives. Yesterday we were at a Christian gathering where several teenagers were being sent on a mission trip for a couple of weeks. One of them was our grandson, Max. As people gathered to pray with them, I found myself at the back of the crowd. I asked the Lord if I should push my way through the crowd so I could put my hand on Max’s shoulder, and I thought the Lord said yes. I pushed my way through the crowd so I was standing directly behind Max and put a firm hand on his shoulder. As the prayers were concluded, Max turned around to see whose hand was on his shoulder and saw that it was me, his grandfather. With big smiles, we gave each other a big bear hug — a small thing, perhaps, but hopefully an encouragement to Max. This entry was posted in God dwelling in you and tagged God dwelling in us on June 14, 2016 by Bill Dalgetty. Does busyness choke out your relationship with God – spending time with him in prayer, reading scripture and seeking his will in your lives? This entry was posted in Christian Encouragement and tagged Busyness obstructin our friendship with God on June 7, 2016 by Bill Dalgetty.